I don’t think you’ve done anything wrong at all, and anyway, surely the food you put in a supermarket trolley is packaged or in bags, so not at risk of contamination. My thoughts exactly! I would be more worried about the raw chicken than a 4 year olds shoes! It’s a good question.. I have stood my daughter many a time in a shopping trolley, to get round the place efficiently and for the fun. But I am forever telling her off for jumping up on a pub sofa or chair, or in fact climbing any public table or chair as this is deemed disrespectful. Table? Well you might be eating your dinner there so a child with dirty shoes on is not good! but really wouldn’t bother me, we have survived this long on the planet dirty feet would have killed us off along time ago if it was a real issue. Shopping trolley? 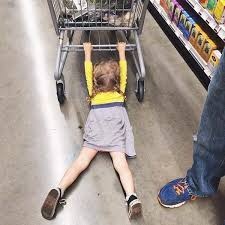 I personally am more concerned with what they (the super markets) put in the food that we put in our trolleys, than the cleanliness of a fantastic child who’s only crime is catching a trolley ride. Throw the kids in the trolley and have fun leave the supermarket food outside the trolley!!! It’s a very good question. I often put my daughter in the trolley, for efficiency of the shop or just plane fun. But I am forever telling her off for climbing on public chairs/tables as its disrespectful. Chair? The worst that can happen is you end up with some mud from the Jones kitchen floor on you bum. Table? Well you might eat off a table so it is wrong to let your daughter run all over one in public. But then do we eat directly of a table? Do we eat directly of a trolley? Trolleys? I would be more concerned with what they (the supermarkets&suppliers) put in the food that we put in the trolleys? than a great kid escorted by a great mum who’s greatest crime is catching a trolley ride. That mud/dirt has been around millions of years, some of what is in our food has only just turned up!! Put the kids in the trolley and have fun, keep the food out of the trolley and build a vegetable garden! Ace reply! I might have this printed on a card so .i can give it to them if I meet them again while shopping! Glad it’s not just me then! I always think of the smart replies too late! I think I was too stunned!